The Enterprise Manager product release parade continues. 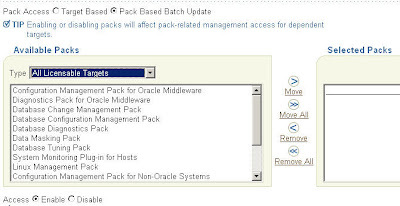 Oracle just released three new management packs: Management Pack for Oracle WebCenter Suite, Management Pack Plus for SOA and Management Pack for Websphere Portal. There are several notable things about these packs. First, they are for both Oracle and 3rd party middleware products, continuing our effort to help Oracle customers proactively manage Oracle products and 3rd party technologies often used with Oracle. Second, they leverage the Composite Application Monitoring and Modeler technology that we acquired last year in order to take Enterprise Manager's ability to discover, model, monitor, diagnose and report on the usage of various Java EE and SOA applications and the artifacts that make up these applications. Additional product information can be found at this website. There is also a very nice recorded demo that shows how the tool works in action, which you may access from this link. 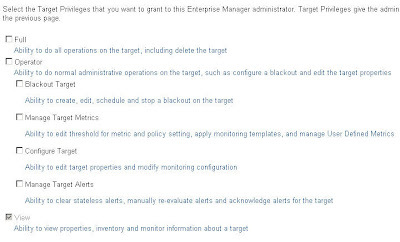 Oracle Enterprise Manager Grid Control 10gR5 is finally here! I hope you all enjoyed the launch webcast this morning. If you missed it, here is the link to the recording. As I mentioned in my post last week, this release is chock-full of goodies that we believe will please everyone from application administrators to DBAs to CIOs and even the business sponsors of your applications. So what are those goodies? Here are some of the most important enhancements. This release takes Enterprise Manager Grid Control's top-down application management capabilities to the next level. Of all the new and improved features, probably the most significant is our expanded support for the Oracle Weblogic Server. 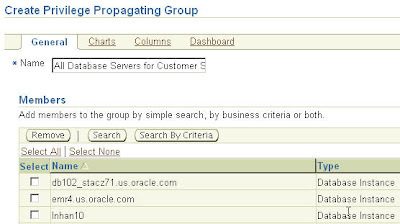 Weblogic support is important because this component serves as the foundation of many Oracle products. Weblogic not only forms the basis of Oracle Fusion Middleware, which is the foundation for upcoming Oracle Fusion Applications, but it is also a key technology used to modernize the various packaged Oracle applications. In other words, improved support for Weblogic management benefits not only administrators of custom Java applications, but also administrators of packaged Oracle applications. For example, the latest Siebel CRM 8.1.1 release incorporates Oracle Application Development Framework into its software stack to enable the latest generation of customer self service applications. As Oracle evolves the current packaged applications using Java EE technologies, it is important that the tools for managing these applications are evolved with them. 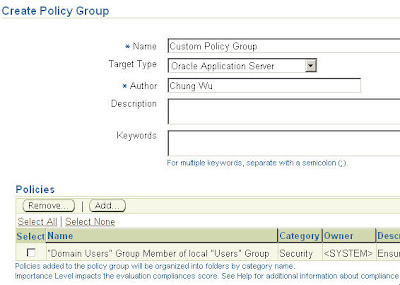 For packaged applications, Application Management Pack for Siebel was refreshed to add official support for Siebel 8.1.1, the brand new version of Siebel CRM that Oracle released recently. In the old days, it was always a challenge to get third party management vendors to support new Siebel releases in a timely manner. As the old saying goes – if you want to get something done right, you have to do it yourself. Now that we build our own management tools, we can ensure that our new application releases are covered. In addition to 8.1.1 support, this new release of the Siebel Pack also include Workflow Process Monitoring, Workflow Policy Monitoring, Event Log Analysis, improved Discovery and Application Service Monitoring. In addition to the updated Siebel Pack, we released new application accelerators for Oracle Real User Experience Insight (RUEI). RUEI helps IT monitor actual end user experience, answering important questions such as: Who logged onto the applications? What did the users do? What response time did they get and what sort of errors did they run into? 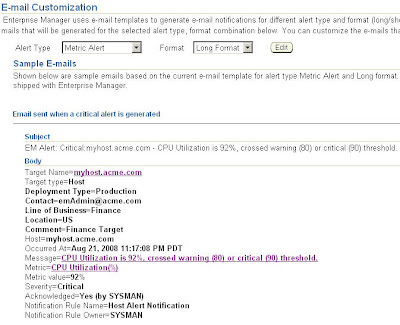 Following the approach that we started with our application management packs to provide tools engineered for specific packaged Oracle applications, our two accelerators – one for Oracle E-Business S uite and one for Siebel CRM, provide out of the box management capabilities for these Oracle applications so that the time to get the tool up and running is reduced. These three packaged application management improvements are just the first wave of enhanced support for Oracle applications that we are introducing for 2009. Stay tuned for more to come. 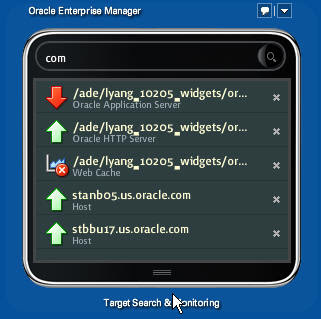 In addition to better Weblogic Server support and improved management for Siebel and Oracle E-Business Suite, 10gR5 also contains support for Oracle Coherence application grid technology, improved support Oracle Service Bus, BPEL Process Monitoring, Java Application Diagnostics, Composite Application Modeling and Monitoring and Application Configuration Management. There is way too much information to cover in one post, so check out this document for an overview, and come back to this blog for more indepth discussions later on. Oracle Enterprise Manager started out as a database management tool, and this 10gR5 release should please DBAs who are looking for further improvements to an already impressive package. This release provides support for Oracle Database 11gR1, enabling multiple database servers to be managed centrally. 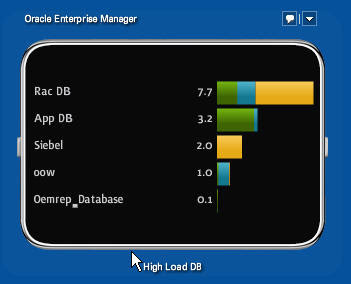 You may wonder – how could 10g Enterprise Manager Grid Control manage 11g Oracle Database? The answer is even though the two products carry similar versioning schemes, Oracle Enterprise Manager Grid Control and Oracle Database are on different release schedules. 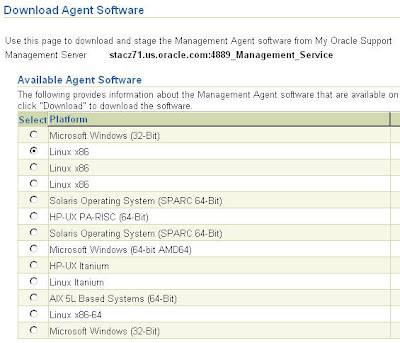 Therefore, there is nothing unusual about using Enterprise Manager 10g to manage an 11g Oracle Database. - a Streams dashboard, along with improved monitoring of streams configurations, allows you to monitor streams components as well as end-to-end paths for Latency and Throughput metrics. These enhancements help DBAs plan their database changes better by leveraging production workload in order to analyze the potential impact of database changes, make changes more easily by automating the migration of changes, and ensure the database is more robust by implementing leading database maximum availability practices prescribed by Oracle's Maximum Availability Architecture guidelines. For a long time, IT decision makers have had to make important IT decisions on less than perfect information. Worst yet, the information available often did not represent the reality faced by IT's customers – the lines of business. It puts IT at a rather disadvantaged position. With Real User Experience Insight and Enterprise Manager's Service Level Management capabilities, CIO can get much better information to demonstrate the value that IT delivers, and to ask for the needed resources using factual information to back up the requests. 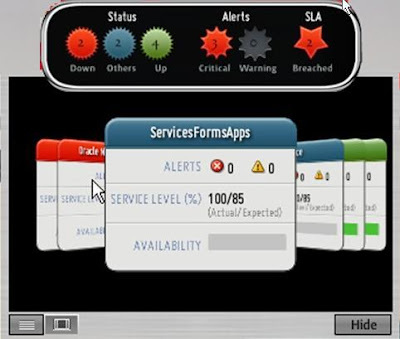 Equally important, the expanding capabilities of Oracle Enterprise Manager Grid Control mean that many important IT assets can now be managed better and with fewer resources. IT is always shorthanded, so freeing up resources mean that the CIO now has the flexibility to invest on new projects that his/her counterparts in line of business have been asking for in order to drive the organization forward. Enterprise Manager's expanding footprint also means that IT departments can move forward with their goals of simplifying their vendor management by consolidating their spending with fewer vendors. Gone are the days when organizations have to go to different vendors to get applications, middleware, development tools, databases, O/S and enterprise management systems. While not direct users of Oracle Enterprise Managers, the line of business sponsors of the applications also benefit from all these improvements. For example, Real User Experience Insight (RUEI) can be used by not only IT administrators, but also business analysts to perform click stream analysis in order to understand consumer behaviors on eCommerce and self-service applications, where increasingly amount of business activities are carried out. When the data collected from RUEI is combined with those captured from the business applications and analyzed using tools such as Oracle Business Intelligence, businesses can get unprecedented clarity on business activities. Traditionally, data captured from business applications such as Siebel E-Commerce show the business activities that actually took place – the service requests that are filed or the orders that are placed. They don't tell why transactions did not happen as users abort their shopping activities. Data from RUEI tells the other side of the picture. Since Oracle develop business applications, enterprise management tools, and business intelligence technologies, we are in the best position to help business leaders put all these information together to achieve insights. I hope that you find these capabilities appetizing. But there's more. Check out the complete list of improvements in the first chapter of Oracle Enterprise Manager Concepts Guide, and come back to this blog as I cover the features in more details in the coming weeks. In my day job, I manage products for managing applications at Oracle, so I spend an awful lot of time with management technologies. From this, you probably think that I would tell you to go get a tool whenever you have a problem to solve. Tools are important, but the truth is they don't replace people and processes. Having the best tools in the world isn't going to help if they are not used properly. I wrote about ITIL v3 in the last article of this series. ITIL is one of the many frameworks available, and different people have different opinions about ITIL. The important thing is not whether to implement ITIL, but to have the right people to implement the right IT management processes using one of the best practice frameworks as guidance first. Tools come in after that. 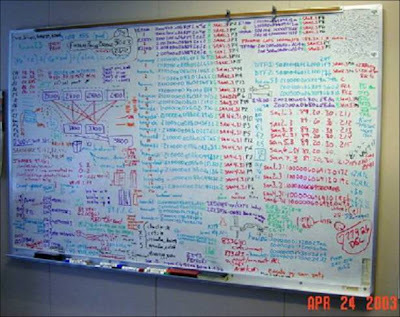 Theoretically, one could implement many IT best practices manually, especially if you throw enough people who know what they are doing at the problem. Realistically though, processes are enhanced through the use of tools, and many important IT management tasks simply do not get done without tool support, as there are not enough people to do things manually in most cases. In this regard, having the right tools can really make a difference. Picture: Is this the right management tool? So what are the attributes of the “right” tool? Here are a couple of my ideas. #1 - It solves the problem. This may seem obvious. The tool has to work. How well a particular tool works depends on whether it is designed specifically for the job. For example, it isn't rocket science to build a basic monitoring tool that collects a bunch of data from a set of monitored objects, filter the data, and provide some sort of alerts and reports. Every monitoring tool out there can do these things. Some, however, require a lot more work to set up because they are essentially toolkits and whoever uses them have to spend a lot of time integrating these toolkits with the technologies they are supposed to monitor. In contrast, a monitoring tool that is designed for managing a particular piece of technology would work much better out of the box. There are many different types of management problems, and it takes different tools to solve them. However, having multiple tools can be rather problematic. For example, the overhead is higher as all these tools need to interact with the underlying technologies being managed. Data is presented in silos and people often end up wasting a lot of time trying to get the tools work together. Tools that provide broader sets of integrated capabilities are better. The first two attributes may conflict with each other. The truth is each of the management vendors has its own strengths and weaknesses. Some are better at managing mainframes, others are more equipped with managing networks, and some excel with handling databases and applications. Finding a single vendor that offers comprehensive and integrated products that are designed specifically for managing everything is just impossible. You probably want to standardize on a couple core vendors that serve your needs, and make sure that their products can talk to each other. You may register at this website. Passcode for registration is "application". Description: Business Intelligence Management Pack anchors Oracle’s solution for proactively managing your Oracle Business Intelligence Enterprise Edition environment. Designed and implemented by Oracle’s application experts, the pack provides comprehensive, integrated, and BI EE-specific capabilities that help you achieve better application performance and availability while keeping your application IT operational costs down. Description: This webinar reviews best practices for the Oracle technology stack and how customers using Oracle's Siebel Customer Relationship Management are leveraging Oracle Real Application Clusters (Oracle RAC); Oracle Clusterware, including disaster recovery strategies; Oracle Enterprise Manager and Maximum Availability Architecture to get peak availability out of their Siebel implementation. Description: Everyone wants their applications from Oracle's PeopleSoft product line to operate with maximum performance. In this webinar, a PeopleSoft performance and benchmark expert shares tips and techniques for maximizing the performance of your PeopleSoft applications. Those new to tuning a PeopleSoft application as well as seasoned tuning experts will come away with new techniques that will help them improve the performance of their PeopleSoft applications. Description: This webinar covers the Oracle E-Business Suite architecture and explains various techniques for installing and cloning by use of Rapid Install, Rapid Clone, and Application Management Pack cloning automation.